Is it a breed or color of Scottish cats? Where can I buy a Scottish Golden Chinchilla? Scottish golden chinchilla is my true love at first sight. The first cat of this color settled in my house a year ago. Her name is Caramel and she is my sunny, bright, plush candy with emerald eyes. I will be happy to tell you more about this color of Scottish Fold and Straight-eared cats, as well as show photos and videos of the first children of Caramel and our handsome Mike. I often get letters in which people want to "buy a kitten of the Scottish Golden Chinchilla breed". This phrase contains a mistake: it speaks of the Scottish golden chinchilla as a separate breed. In fact, the breed is Scottish, and the color is a golden chinchilla. Cats of the Scottish breed may have other colors. Cats of other breeds may have a golden chinchilla color. A bit of history. 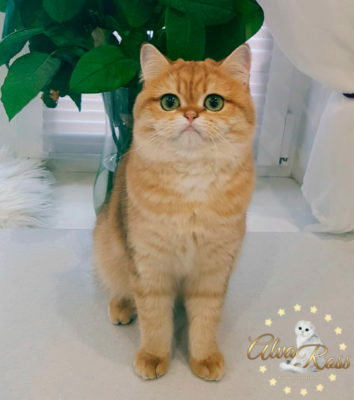 This color Scottish and British cats received from Persian cats about 50 years ago. The tail tip, as well as the paw pads, the nose, eyes and lips borders are colored in base color. My Scottish black golden shaded cat Caramel looks very bright. 2/3 of the length of each of her guard hairs and the undercoat are colored apricot. However, the high saturation of the yellow (feomelanin) staining is what makes her truly “golden”. 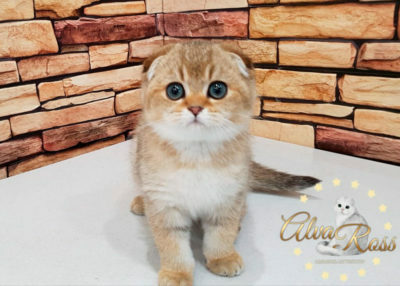 This is the main difficulty of breeding cats of this color. The inheritance of the golden color in relation to the black tabby color goes according to the type of incomplete dominance. This means that the weaker recessive trait can not be completely suppressed by the dominant. Therefore, kittens from mating gold and black tabby in most cases have an "intermediate" color: their guard hairs are colored apricot, but the undercoat is colored gray. In most cases, their eye color also remains pale green. 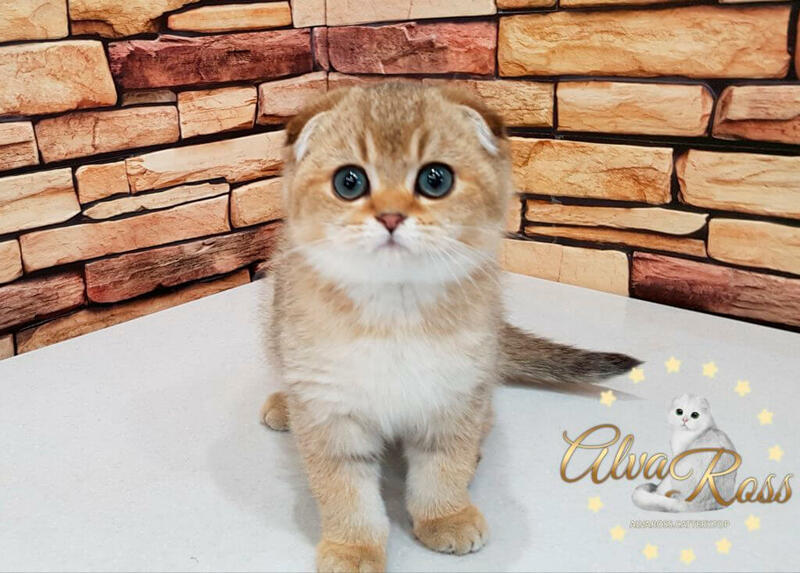 Consequently, both parents must be of high-quality golden color so that their offspring also have a high-quality golden color. 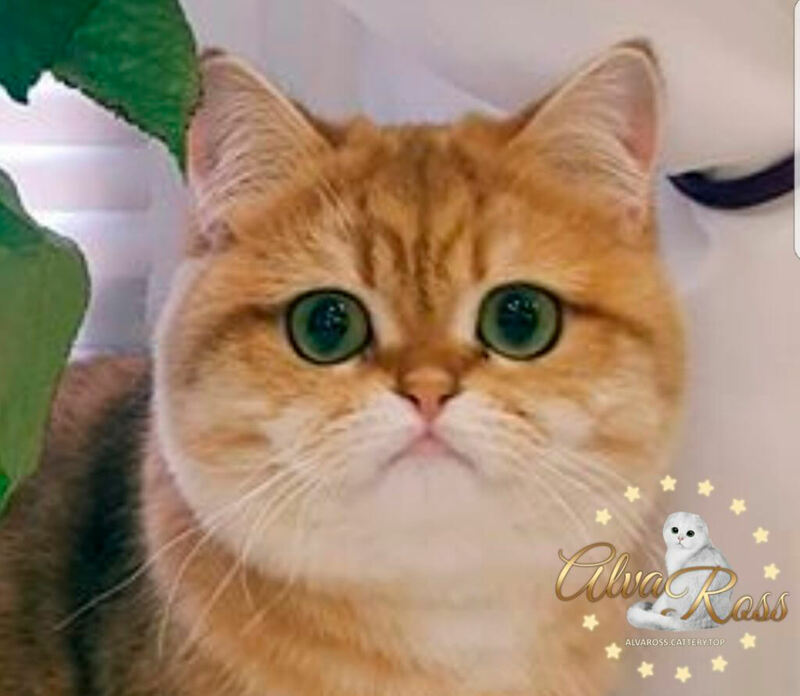 In breeding work with gold colors, you can also use silver-colored cats, if the breeding pair has true gold ancestors. 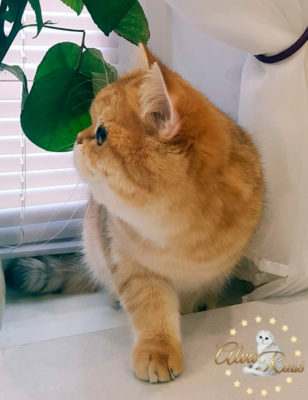 Let me show you more photos of the Scottish Straight golden chinchilla cat - Caramel. Incredibly expressive eyes! 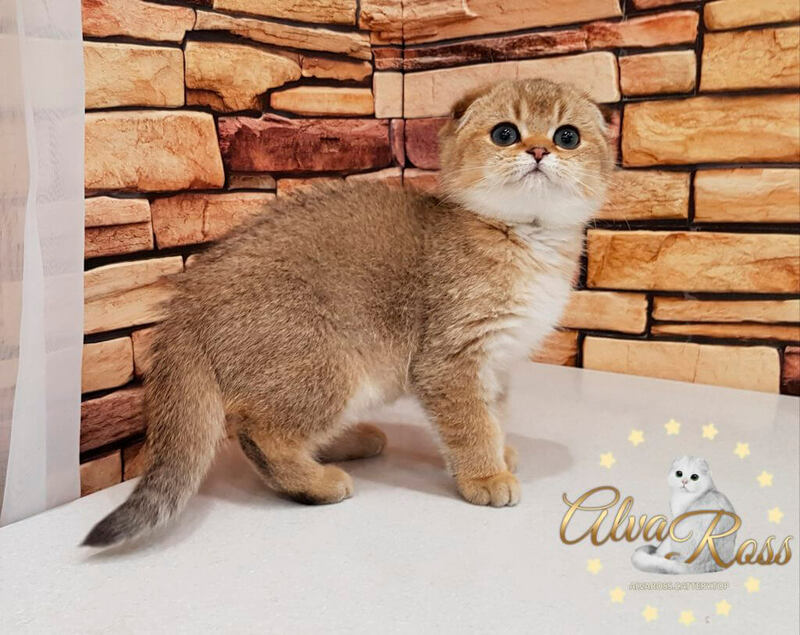 And here are photos of the charming Scottish fold kitten of golden chinchilla color. 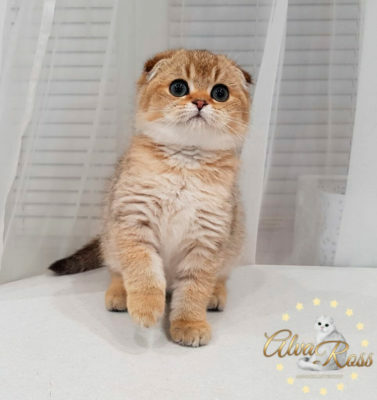 You can also see more photos of these beautiful cats and kittens on the pages: “Scottish Fold Golden Chinchilla Photo” and “Scottish Fold Cat Golden Chinchilla Photos”. Watching Scottish gold chinchillas is incredibly interesting! Watch this video with our playing kitten! 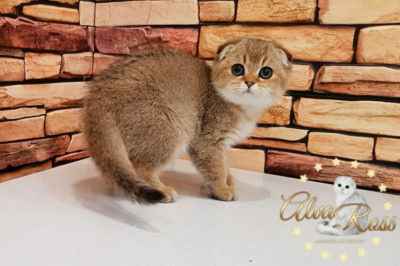 You can buy a Scottish golden kitten in my professional cattery. 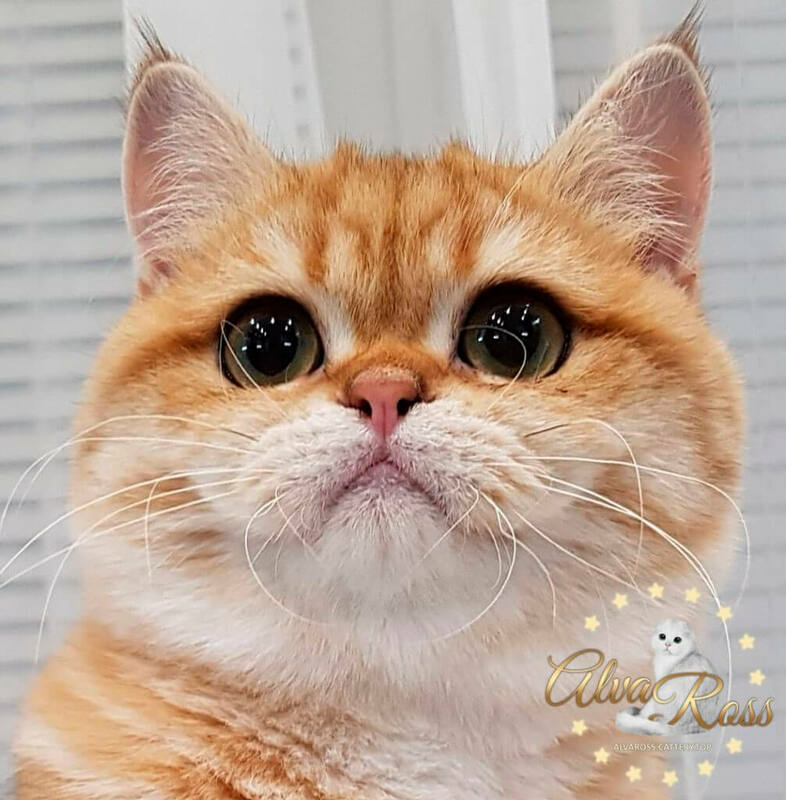 My cattery AlvaRoss has an official registration with the World Cat Federation (WCF - №11412-2016) and is a member of the “Amulet-cat” (WCF) and “Zoomir” (OFA) clubs. 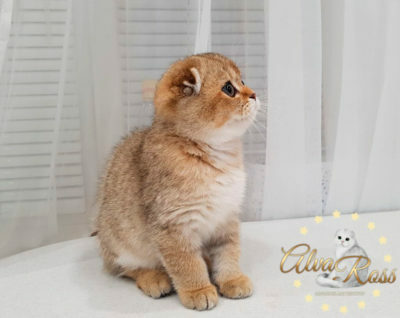 I (my name is Natalia) have a diploma-confirmation of my “Feline Breeder” qualification (diploma №AC-0005/2016-11-02). My cats are beautiful, healthy, smart, high-quality members of my family and show winners. We live in Volgograd (Russia). If you live in another city, in another country or even on another continent - this is not a problem! I will help arrange delivery. It was a short story about my cattery and about me. I will be happy to answer your questions - you can write to me using the contact form at the bottom of this page! 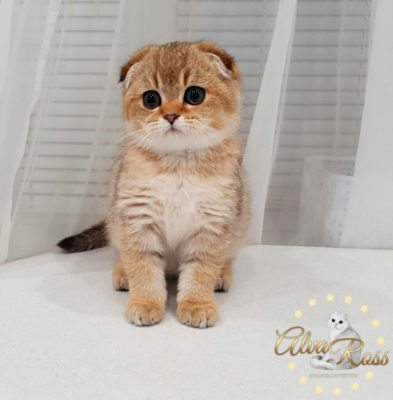 The price of any Scottish kitten depends on many factors: gender, type of ears (fold-eared or straight-eared kitten), color, purpose of its purchase (as a pet or for breeding), its health condition (whether its parents have tests or not), titles and fame of its ancestors, etc. If we are talking about Scottish gold chinchillas with the right to breed and for cat shows, their price can reach several thousand dollars. High-quality Scottish gold chinchillas are a rarity. They are expensive. If we are talking about Scottish gold chinchillas as a pet, their price is several times lower. If you like one of our kittens - feel free to contact me. I will tell you more about this kitten and its terms of sale. Chinchilla cats from my cattery are very smart and affectionate friends. I get a lot of feedback from the new owners of my graduates and regularly share it on my social networks. These reviews inspire me! 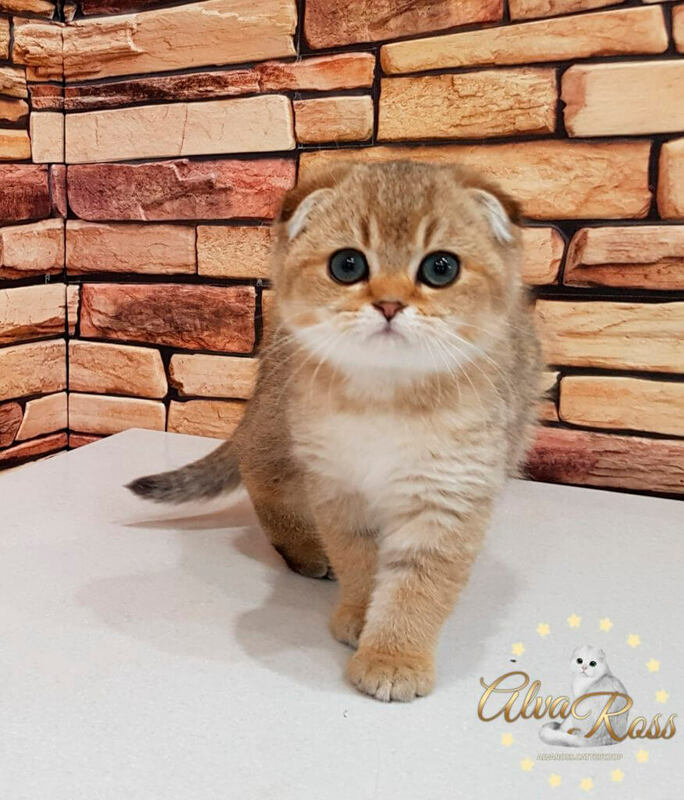 I am very glad that the Scottish fold and Scottish straight kittens that were born in my house now bring happiness and joy to their new families!